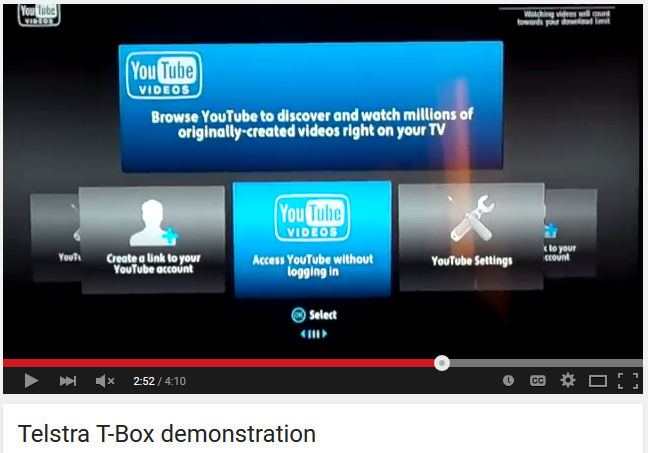 YouTube was available on Telstra T-Box until 20 April 2015. Now its back. Among disappointed T-Box owners is a group of young software enthusiasts who are developing this project so they can watch millions of originally-created videos from YouTube right on their TVs. YouTube's decision to withdraw support for an older interface that the Telstra T-Box used has affected more people than the 800,000 Australian families who own a T-Box. Telstra isn't the only business with customers disappointed by the loss of the YouTube application that needed Netgem and YouTube to work together. The Telstra T-Box is made by Netgem and has been sold to national Telcos in many countries. Dear Mr. Lines .. Your answer is at least funny if nothing else! How do you propose as a solution to replace your TV? Since SiOL not able to repair applications let users buy TV in November? Some pay "advanced services SiOL BOX", which should also cover YouTube! The same is doing in removing useful TV programs - easily delete, we are paying to continue or even paying more for less .. But that's another story .. In short, because I already know a little regarding YouTube and on why, among other things also does not work when you're gonna let a little more to write in what is the problem .. YouTube constantly update its API and came to the fact that older versions abolished because only slow down Development - this is normal. From software developers are expected to update its software code to be compatible with the new APIs .. Here you get it "cvek" because the failure krivga YouTube-a complete on your site and YouTube never said that SiOL not play YouTube -alkyl Your assertion that krivga on YouTube is therefore a lie and deceive users only! Guilt is on the side of SiOL not updated interface for playback of YouTube-but on the box and nowhere else! Write that you do not think to update the interface and you decide to YouTube but the sky longer possible via the BOX - whatever! Just do not lie to people that YouTube is guilty of inaction!